Wine has been made in Sicily since ancient times. The soil and climate are ideal for the purpose and most farmers and smallholders would have had their own vineyard, producing wine for the family. Many varieties of grape are now cultivated and many different wines produced in what has become a wine-lover’s paradise. Arrive at Catania airport, collect your hire car and drive to Modica (117km). Overnight at the Agriturismo Il Granaio, Ragusa. Spend the day visiting some of the island’s most important Baroque towns, notably Noto, Modica, Ragusa Ibla and Syracuse (Ortigia Island), located in the south eastern corner of Sicily. Opportunity to taste the rich dark chocolate produced in Modica following ancient Aztec recipes and the delicious local cakes and pastries with their unique flavours. Enjoy a home-cooked meal at Il Granaio’s restaurant – local recipes prepared by the owner’s mother. Drive to Piazza Armerina (116km) and visit the ancient Villa Romana del Casale, a UNESCO World Heritage Site. This fabulous Roman Villa contains a collection of some of the most important, well-preserved mosaics in the world. After breakfast, drive to your next property in Menfi (231km). This picturesque, family-run winery is located in Sambuca di Sicilia in the Valle dei Belice, on Sicily's west coast. During the harvest season (Aug-Sep), guests are invited to participate in the winemaking process. En-route stop off in Agrigento to visit the impressive Valley of the Temples. This ancient, archeological park has six Greek Temples including one of the best preserved Doric Temples in the world. Overnight at the La Foresteria, Trapani. 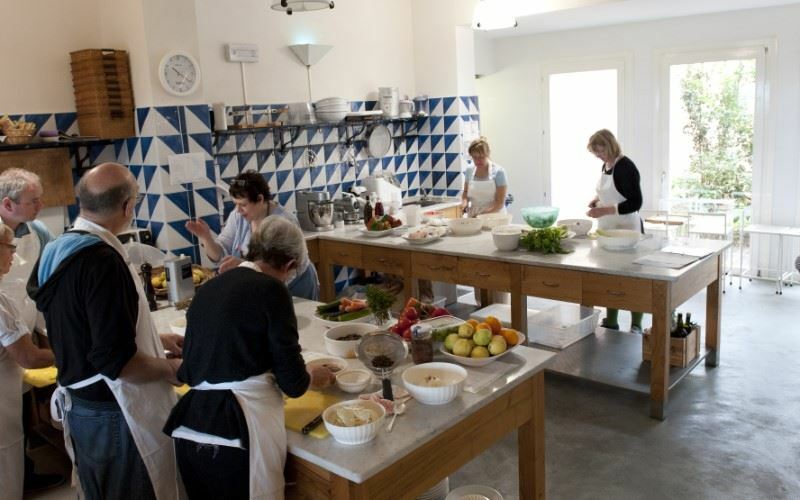 Take a cooking class, led by Chef Angelo Pumilia, using recipes from ‘Sicilia, the cooking of Casa Planeta’ cookbook. In the evening enjoy some wine tasting and an intimate meal in the substantial wine cellar. Visit the Cantine Florio in Marsala (60km). The Woodhouses, the Inghams and the Whitakers were late 18th century English traders and merchants who became wealthy through exporting Marsala wine to England and the United States. They fortified the local wine with alcohol, using the Spanish solera system, thus enabling it to survive the long sea journey back to England and across the Atlantic. This was hugely successful and their successors continue to this present day, although there are no longer any members of the family left in Sicily. At the Cantine Florio, one can still admire (framed on a wall) Nelson’s original order for wine for the Royal Navy, with which it was understandably very popular, signed by him as Duke of Bronte. After the Battle of Trafalgar it became, for a time, known as ‘Victory Wine’. Visit La Planeta family cellars and oil mills for tastings and lunch (payable locally), or head to the coast to sunbathe on Menfi’s 10km stretch of sandy beach. After breakfast, drive to Palermo airport (108km) for your return flight home. Within the Val di Noto, a 5 minute drive from Modica, the Granaio welcomes its guests into a tranquil family atmosphere. Within the Val di Noto, a 5 minute drive from Modica, the Granaio welcomes its guests into a tranquil family atmosphere. This rural property, built on the foundations of an old farmhouse, stands in the deep Iblean countryside, characterised by wide fields and unending pastures, with the dry stone walls typical of the area and the Mediterranean machi’ of aromatic plants, vivid with colour in springtime. Hospitality and good food are not lacking: Giovanni will suggest places for you to visit and will sometimes even be your guide; his mother will delight you with traditional Sicilian and Ragusan dishes, which Giovanni will describe to you in detail at the table. The ancient family of Planeta, whose prestigious wines are renowned both in Italy and abroad, have opened the doors of their guesthouse to visitors who would like to discover the world of Bacchus, devote themselves to cookery lessons, or simply enjoy the archaeological and natural beauties of the surrounding countryside. The ancient family of Planeta, whose prestigious wines are renowned both in Italy and abroad, have opened the doors of their guesthouse to visitors who would like to discover the world of Bacchus, devote themselves to cookery lessons, or simply enjoy the archaeological and natural beauties of the surrounding countryside. This elegant wine estate extends over 35 hectares and lies on a vine- covered hillside, from where panoramic views stretch as far as the sea and Menfi itself which, in 2014, received its sixteenth blue flag from the Foundation for Environmental Education and whose sandy beaches stretch for nearly 10km. The scent of the herbs surrounding the wine resort enrich the dishes created in the kitchen, a real treasure house of flavours from a territory of excellent wine.